Alden Sylvester in his new Wilton store. WILTON - Alden Sylvester is putting the finishing touches on a custom display case as he readies his new store, the Power Plant, for its February opening. Exotic padauk wood meets curly maple, all glossed to a high finish. The atmosphere is inviting, clean, and full of beautiful art. The shelves will soon be stocked with some of the state’s best medical cannabis, grown by HBC Maine. The Power Plant is the brainchild of Sylvester and HBC Maine, seeking to bring the highest quality, Maine-grown medical cannabis to patients in a convenient location. 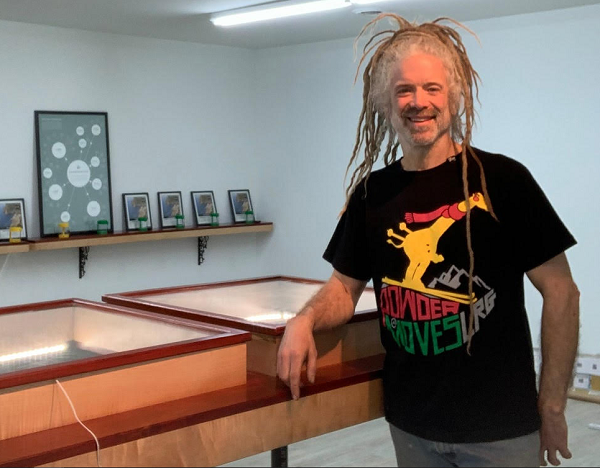 In addition, the store will have specialized growing amendments and tools, for growers of food and medicine, to balance their soil and grow healthier plants, as well as Maine artisan limited goods such as burl bowls, paintings, and many other hand-made works. Sylvester is easily recognized among locals. A former proprietor of Liquid Sunshine, his business experience was gained traveling the world to source the popular artisan items the store featured, returning to the college town with these wares as a cheerful fixture on Main Street. A Houlton-born son of a lawyer, his long silver dreadlocks belie an organized and sunny demeanor. After parting ways from the popular Farmington store, Sylvester spent years refining his retail wish list. After being called back to Maine and it’s growing acceptance of medical cannabis, Sylvester became a caregiver, continued to refine his growing techniques, and is now ready to showcase his expertise at the Power Plant. The Power Plant was approved by the town of Wilton last fall and will be open Tuesday through Saturday, 11 a.m. to 7 p.m., and Sunday and Monday 11 a.m. to 5 p.m. It is located at 410 US Rt 2 E Wilton, ME 04294. Welcome to Wilton! It's great to see new businesses in our town. I wish you great success. Because this area needs yet another pot related venture. C'mon peeps. Wish him well. Maybe he'll hire some of those that just got pink slips in town. Call me a Cynic.....although I also don't agree with yet another "pot related" venture, if you read the whole story, he sells much more than just medical pot. I love Liquid Sunshine for all the artisan and unique items they sell. It says here that he will be featuring some of those things in this store, including art and handmade items. You can also get information on your soil for your food gardens. I am not a pot user, but I just might go check out this store for the other items he will be selling! Regarding the "pot related venture"- would we say that about another discount retail store, another antiques store, another restaurant that sells fried food, another ice cream stand? We already have a lot of those businesses, and we welcome more. The store looks beautiful, it will pay taxes, people will shop there, people will be employed and sell locally made goods there- sounds great to me. I wish him the best of luck! Good for him and the best of luck. It strikes me that no one raises an eyebrow (which is getting harder for me every day) when another beer related venture opens. What I have noticed is the beer related ventures are applauded. Alcohol is bad. Yes, let's call it what it is. Alcohol is a drug, THC is a drug. Use whichever, all you want, and justify it however you want for whatever reason. I don't really care for the promotion so I don't patronize businesses that do as their main focus. Eddie people also drink beer to get buzzed, and some to get drunk. I also see not a lot of medical benefit from it. Welcome to (or back to) the local business community! Good to see a a business like this not hiding what they do unlike like so many other cash in hand "businesses" around here. Looks like they're educating just as much as being a business. The education part is apparently needed before passing uninformed judgement. I look forward to seeing more local art too! Eddie: You are right, there is no comparison because they are very different things. One is a plant grown is soil or water and the other is a highly processed fermentation of many ingredients that produces a drug called alcohol. To say you drink beer merely for the flavor makes you sound like an alcoholic unless you drink non-alcohol based beers. You know, for the the flavor. Most self medicating drinkers I meet say they like the flavor but drinking every day is also about relaxing pain and the mental stress of the day. Something I see in the current Medical Marijuana community is that "taste" is very important since there are 100's of strains that produce, like beer, different affects and flavors. Every day I see people at the bars downtown self medicating with beer then driving home. I don't mind other than on Friday and Saturday nights due to the chances of getting hit by a beer "Connoisseur" who lacks the motor coordination to drive a vehicle. I stopped in to check out this new business. I do not use pot. There is a lot more to this business than pot. Alden was very informative about amending soil for vegetable growth for home gardeners and plans on possibly doing personal soil amendments based on soil analyzes for personalized nutrient mixes for your soil type. He was a wealth of information on edible native plants, chaga and he has tinctures available for your health. Artisans have beautiful Burl bowls available as well as paintings. He has plans to add more to the store and we even discussed the possibility of some educational classes in the future. This is a medical marijuana provider by prescription only not a recreational provider. I agree with Sandy, Alcohol is a legal drug that destroys countless lives every day and is legal because the government makes so much money on it. Water tastes good also and doesn't ruin lives. Welcome to Wilton Alden and good luck.